The beautiful little town of Homer Alaska has a picturesque setting, a mild climate, and great fishing that attracts thousands of visitors each year. Homer calls itself the “Halibut Fishing Capital of the World.” Homer Alaska is also the jumping–off point to Kachemak Bay State Park – one of Alaska’s most popular parks for sea kayaking, hiking, fishing and beachcombing – accessible by floatplane or private water taxi. Homer also serves as the gateway to McNeil River State Game Sanctuary on the west side of Cook Inlet and Katmai National Park, both known for brown bear viewing and both accessible by floatplane. Homer also provides access to Fox River Flats Critical Habitat Area via a steep switchback trail that leads down to the flats. Home to the Discovery Channel’s “The Last Frontier” Kilcher family, and homeport to the F/V Time Bandit of “Deadliest Catch” fame, Homer’s museums, art galleries, fine dining and seaside accommodations, all help create Alaska-sized memories to last a lifetime. The Homer Spit (“spit” is a geological landform) features the longest road into ocean waters in the world, and was named one of the best 100 beaches in the United States for its incredible views and variety of wildlife along the 4.5 mile multi-use trail that runs from its base to its tip – the true end of the road on Alaska’s Highway 1. As with much of South Central Alaska, Homer has a moderate subarctic climate due to the cool summers. Winters are snowy and long but not particularly cold, considering the latitude, with the average January high only slightly below freezing. Snow averages 50 inches per season, falling primarily from November through March, with some accumulation in October and April, and rarely in May. Summers are cool due to the marine influence, with 75 °F highs or 55 °F lows being extremely rare. Extreme temperatures have ranged from −24 °F on January 28–29, 1989 up to 84 °F on July 22, 2011. 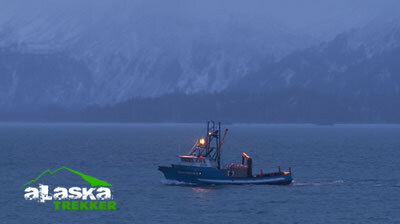 Kachemak is a magnificent deep-water bay that reaches inland from Cook Inlet for 30 miles and is rich in marine life. The wild timbered coastline of the south shore, across from Homer, is indented with many fjords and inlets that reach far into the rugged glacier–capped peaks of the Kenai Mountains. Rising behind the town site are gently sloping bluffs, which level off at about 1,200 feet. These green slopes are tinted in pastel shades by acres of wildflowers each summer. Perhaps the beauty surrounding Homer explains it’s large artist community. Potters, sculptors, painters and jewelers practice their crafts and sell their goods in local shops and galleries. Seldovia is located across the bay from Homer Alaska. This unblemished semi remote village lies beyond the end of the road in one of the most pristine and wildlife rich settings on Alaska’s Kenai Peninsula. Access to Seldovia is limited; there are no roads, bridges, trails or trains encroaching into this wilderness setting. To get to Seldovia, you are limited to either boat or aircraft travel. Seldovia, one of the Kenai Peninsula’s most historic towns, is a quiet fishing village of approximately 450 full time residents. The village is filled with historic landmarks from a time long past. Visitors to the area are rewarded with authentic Alaskan charm, friendly and honest residents, cultural rich visitor attractions, and most of all, a peaceful and relaxing atmosphere of old Alaska that has been known to cure the restlessness of everyday life. The Homer Alaska area has an abundance of places to fish. You can fish from land or a boat in Homer. This region of Alaska is particularly noted for its strong runs of halibut. The finest salt water fishing for giant halibut, pacific cod, and rock cod is also available. Try the Homer “Fishing Hole” for easy fishing or charter a boat with Capt. Mike at Capt. Mike’s Charters. 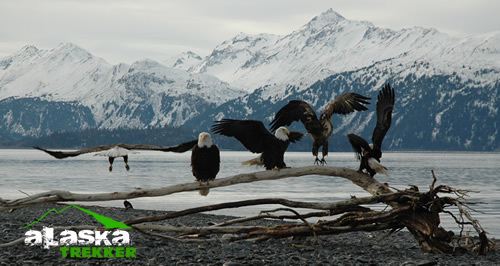 Homer Alaska is located on the north shore of Kachemak Bay on the southwestern edge of the Kenai Peninsula. The Homer Spit, a 4.5-mile long bar of gravel, extends from the Homer shoreline and is a center of activity for the town. It is 227 miles south of Anchorage via the Seward and Sterling Highways. Homer is the Southernmost town on the contiguous Alaska highway system. It is also part of the Alaska Marine Highway (the Alaskan ferry system). The regional airport lies near the coast as well, with two local air taxis and scheduled flights to Kenai and Anchorage. Homer constructed its first traffic light in 2005. 9 hotels/motels and 9 lodges/cabins; 100 bed and breakfasts; 31 restaurants, one hostel. 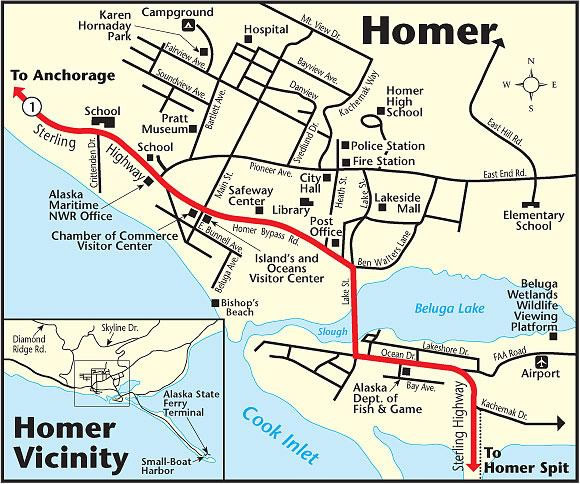 Here’s the Homer tourist website if you’re interested in more information.